First of all I have to tell you that once again the Lord has proven that He hears and answers prayers. Remember, me saying a while back about how desperate we were getting in the food department? Well this morning we totally ran out. So Alan decided that we had no choice but to go to the food bank. He came home empty handed, the food bank was closed. I was sitting here scrapping away and he was here reading the paper online when we heard a knock on the door. When we answered the door, a person was standing there and announced that they had brought lunch but needed help bringing it in. Alan went to help them and I said a quick "Thank you Lord!" thinking it was "McDonalds" and was very happy. Then they started bringing in bags and bags and more bags of groceries. Soon my floor and table were literally covered with bags of groceries. I had to put some of it in the closet because I didn't have enough room in the cupboards to hold everything. Now, normally when a person "helps out" someone with some groceries, they get the basics. Not this person, oh no, not only were the basics included but also the luxury articles like cream cheese, cottage cheese, all kinds of fruit, butter, cookies, cat food, even a cake mix and icing, and Coke. I feel so much better now that the stress is gone. I can't believe that I stressed when I know that God has never ever let down and I should have known that He wouldn't this time either.. yet I was still shocked! So little faith.. shame on me. 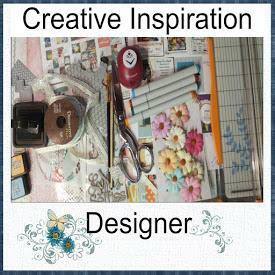 I also created two layouts today. Two more birds photos done :) Making some more progress here, was thinking tonight that maybe I should slow down or I won't have anything to scrap over those long winter days that are coming. I can only post the one tonight though because it was too late to take a pic of the other one. 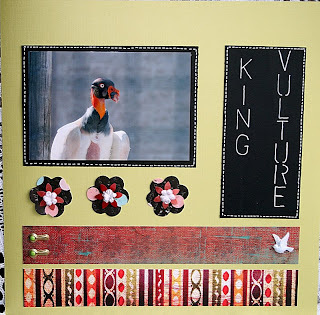 Here is the King Vulture, it is so ugly its cute. Jackie, I am thrilled that someone was so kind to bring you a bunch of food. Nice extra treats too! I totally believe what comes around goes around, and you have been so wonderful to so many, that it will come back to you, and apparently just has. This is a strong testament in the power of prayer and that there is goodwill still in the hearts of man. Have fun with all your new stamps! Hey, Jackie! I've been out of blog action for a while - life has been crazy. So glad to see your blessings! Loving your creations too. That's Cool! I'm so happy for you! Can I come to dinner? :-) (just kidding). I would say: God Bless you, but apparently He already has...ah well....God Bless you, anyways! I like that layout of the vulture. I love the colours and that pic of the vulture is REALLY good!